Preheat oven to 350°F. In a large bowl toss apple slices with lemon juice, maple syrup, cinnamon and nutmeg. Transfer apple mixture to an 8x8 inch baking dish, making sure to scrape out all the liquid. In the same bowl stir together oats, flour, brown sugar and salt. *If butter is cold, use the large teeth of a box grater (aka cheese grater) to grate in butter. Use hands to mix in butter with oat mixture until it appears crumbly and butter seems evenly distributed. If butter is at room temperature use a fork to mix it into oat mixture. It will appear softer, more like a cookie dough, than crumbly. Sprinkle topping evenly over apple mixture, trying to cover all gaps. Press down lightly to make sure apples and topping make good contact. Bake in centre of the oven for about 45-50 minutes, or until topping is nicely browned on top and apples are bubbling over the edges. 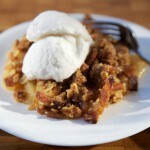 Allow apple crisp to cool for at least 30 minutes before serving. To reheat place in 350° oven for 10-12 minutes from room temperature or 15-20 minutes from fridge. Scoop out and serve with plain yogurt and a drizzle of maple syrup, good quality vanilla ice cream or coconut ice cream.